Have you ever seen a young child with a pouting face? You know, the bottom lip stuck out and the sad puppy dog eyes, on the brink of tears? Well picture all this on a grown woman....yes, me!!!! That's what I looked like yesterday when I found out my books hadn't shipped yet like I was told. Nope! Instead, they shipped this week. So now I'm told they should arrive early next week. Pout! So, of course, this means I won't be signing, packaging, and shipping anything this week. Pout some more! I do apologize to those of you waiting for your book. Pouting a lot more! Ok, time to buck up and take it like a woman! So yesterday, before I knew my books weren't coming, I was keeping busy. 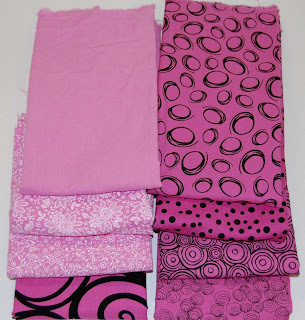 I threw one batch of fabric into the washing machine to dye. Love this shade of pink. I actually mixed the pink IDye with just a smidge of violet for this shade. 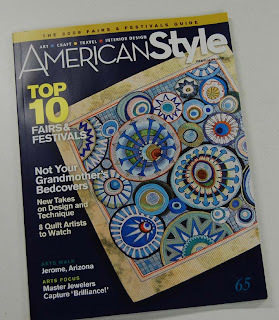 And in my mailbox I found my issue of American Style. I am loving this issue. It's got a lot of quilt art in it and the cover piece is awesome. The artist who created the quilt shown on the cover is Marianne Burr, a new name to me. There is another quilt inside that she made that is just as wonderful. And there are many other artists that are mentioned. Another thing I noticed with this issue is there are many more quilt and textile artists with advertisements. The advertisements are as wonderful to look at as well. I've been buying this magazine for over a year now and I just love the fabulous art found in the pages. Even though most of the art, up to this point, hasn't been quilt related, I still find the other art mediums very beautiful and inspirational.